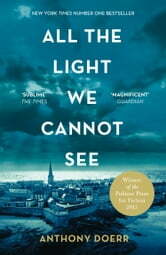 WINNER OF THE 2015 PULITZER PRIZE FOR FICTIONNATIONAL BOOK AWARD FINALISTNEW YORK TIMES BESTSELLERWINNER OF THE CARNEGIE MEDAL FOR FICTION A beautiful, stunningly ambitious novel about a blind French girl and a German boy whose paths collide in occupied France as both try to survive the devastation of World War II Marie-Laure has been blind since the age of six. Her father builds a perfect miniature of their Paris neighbourhood so she can memorize it by touch and navigate her way home. But when the Nazis invade, father and daughter flee with a dangerous secret. Werner is a German orphan, destined to labour in the same mine that claimed his father’s life, until he discovers a knack for engineering. His talent wins him a place at a brutal military academy, but his way out of obscurity is built on suffering. At the same time, far away in a walled city by the sea, an old man discovers new worlds without ever setting foot outside his home. But all around him, impending danger closes in. Doerr’s combination of soaring imagination and meticulous observation is electric. 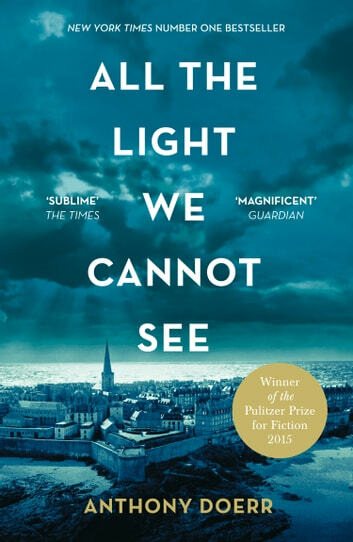 As Europe is engulfed by war and lives collide unpredictably, ‘All The Light We Cannot See’ is a captivating and devastating elegy for innocence. 25 pessoa achou esse comentário útil. BASICALLY: Told in dual perspective (mainly) the story follows two young adults from the outbreak of World War 2 and how their lives are affected by it. IN DETAIL: I saw this book in a bookshop one day when I was wondering around and I thought it sounded really interesting, and it really really really was. I don't think I'll ever fully recover from it, it was such a unique and enlightening book and reminded me so much of my one history lesson - I remember my teacher turning to us and saying not all Germans supported Hitler, in fact not that many supported Hitler, less than 50% voted him into power and this book really reiterated that too me in a way no book has managed before. THE PLOT: This book is told in a series of flashbacks from an event that happens in 1944. The dual storylines are both extremely interesting and look at the foundations of two separate peoples lives and how two people who are worlds apart could come together. The book begins before the Second World War, before the rise of Hitler and the perspective of his power from the young German's POV was really moving, and I found myself genuinely sympathetic to his character and his circumstances. The story in France that unfolds is just as interesting, and the impact of how blindness can change someone's life and those of their family were wonderful to read (not in terms that she went blind but in terms of how it changed things). And the impact of the outbreak of war was also communicated really well, and how that changed their lives. Within the book their were several other storylines that were fantastically conveyed and completely enjoyable, and personally I wish the book had been even longer so I could read even more. THE CHARACTERS: Werner and Jutta (who shouldn't be thrown together but for the sake of this review I am going to) were such brilliant characters. I loved them both so much, how inquisitive they were and intelligent, and how Jutta understood the world in ways Werner couldn't. I thought that they were wonderful. Marie-Laure was also a sweetheart, I loved reading about her strength and perseverance. She was brilliant, and I couldn't wait to read more about her. The supporting characters were equally as brilliant and wonderful and they felt so well 'built' (for lack of a better word) not two dimensional as supporting characters sometimes can feel. MY THOUGHTS: I'll be honest, this book had me crying more than once, it dredged up history lessons I thought I had forgotten and the emotions I felt when I was told how many people had died in WW2. It's something that has affected my life as like many people I had family members who fought in both WW1 and WW2 and just hearing what it was like in any way is extremely emotional, to think that's what they had to live through and the courage that must have taken. I cannot recommend this book highly enough, just, read it. Learn from it. And let's hope that none of us ever repeat the mistakes that led to those two terrible world wars. 17 pessoa achou esse comentário útil. I did not want to finish this book as it is one of the most lyrically written novels I've ever read. It's subject and story are tightly woven and it resonates with its historical context and is paced like a carefully woven tapestry. It provokes great emotion and lingers in the mind like a mist. Read this book it's wonderful. Although I would never normally read a war story from the moment I started reading All the Light We Can Not See I was hooked. I loved thc characters and how the storyline effortlessly brought them all together for a gripping tale which I could not put down. Van het begin tot het einde wist dit boek mij te boeien. Prachtig verwoord (Engelstalige versie), de zinnen vloeien in elkaar over. De schrijver heeft een Duitse soldaat en een blinde Française gebruikt om de twee kanten van één gruwelijke oorlog te laten zien. Dat is goed gelukt. I read this book as a book club choice and really liked the storyline and the characters. It was interesting how lives from different parts of the world have impact and intertwine with each other.